Acme FA1426-XD Front Access server. 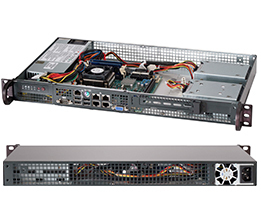 Acme FA1426-XD is a small form factor & powerful server. Powerful computing Xeon D-1540 with DDR4 memory, 2 x 10GbE and 2 x GbE LAN in 1U 9.8 inch rackmount chassis. Xeon D-1540 is a big computing power processor with 8-Core, 16 threads, 12MB cache, TDP 45W, frequency 2 to 2.6GHz. This system is good for Web, VM, industrial applications. Drive Bays: 2 HDD 2.5" bays or one 3.5" bay. * Easy setup, easy maintenance, saving cost and fit in standard 19" rack space. ** all connectors (include add-on card) are accessible from front panel. Supports up to 128GB DDR4 ECC Registered DIMM. 1 (x16) PCI-e 3.0 slot. 6 ports Serial ATA (SATA3) 6Gbps. VGA port - On-board Aspeed AST2400 graphics. 2 of 2.5" HDD bays (upgradable to 4), or one 3.5" space. Width: 17.2 in. Height: 1.7 in. Depth: 9.8 in.